Strawberries are cultivated worldwide and are known for their bright red color, juicy texture, and sweetness. They are a popular fruit and not just among us humans. The low-lying strawberry plants are actually easy for wild rabbits to reach, something fruit and vegetable garden owners might know only too well. 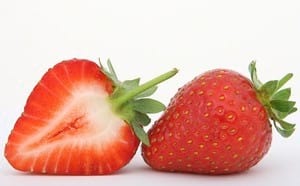 Strawberries have a sweet taste because they are rich in sugar. This means they are to be considered as a treat for your fluffy friend. Too many strawberries may lead to stomach troubles. As with all fruit, portion control is key in order to ensure a healthy diet. As a general rule of thumb, don’t offer more than a strawberry per day per rabbit and alternate with other fruits. If it’s the first time offering the treat to your bunny, then introduce slowly. Can Rabbits Eat Strawberry Tops or Leaves? If you’re wondering whether your rabbit can also eat the strawberry tops or even the strawberry leaves then the answer is yes. They can actually eat any part of the plant, just make sure to clean with streaming water before feeding. Conclusion: bottom line, strawberries are a great occasional treat for your rabbit. Does your rabbit like strawberries? Let’s us know by leaving a comment.